Don't Blink Or You Will Miss The Stock Market Crash! The bottom line is that NO ONE SAW THURSDAYS CRASH Coming - NO ONE! Because it is Impossible to Forecast Stock Market Crashes as I have iterated several times over the years and in the Inflation Mega-trend Ebook. Anyone that says they saw it coming are giving you a load of B.S. However, thankfully stock market crashes DO NOT usually come out of the blue but mark a continuation of an existing downtrend. The only thing a trader can do is to have been triggered SHORT AHEAD of a Crash as a consequence of HIGH probability Price Triggers. The Dow triggered its first Sell signal since February on Tuesday 4th on a break below 10,970 and then the second sell trigger at 10,830 on Wednesday 5th both of which have been mentioned during the past 3 weeks newsletters(02 May 2010 - Greece Debt Crisis Storm Cripples Stock Market Rally Resulting Stock Price Churn ). These triggers first targeted 10,750 and then 10,550. On Thursday 6th, the Dow managed to hold onto the target of 10,750 during the morning (US Trading), however during the afternoon the Dow breached 10,750 and the trend lower started to accelerate lower by 2pm at 10,700; 2.30pm at 10,600, shortly after which all hell broke loose! Me ? at 2.30pm (7.30pm UK) I was off to cast my vote, returning 30 minutes later at about 3pm (8pm UK), the only thing on my mind where trading was concerned was to see if the Dow had continued its bounce off of 10,550 or not as I wanted to go flat ahead of a long, long election night. Instead of Dow at about 10,600, it was oscillating around 10,400, furthermore the chart showed a low of 9,872! My immediate reaction was to cover the Short and Buy BP that I had been monitoring for a buying opportunity following the oil spill. The volatile rally continued taking the Dow to back above 10,550, and appeared to be stabilising so I googled to see what would come up and NOTHING came up, NOTHING. So I quickly wrote a short article within 15 minutes that gave my own quick take based on my assumption that the panic was probably Euro and Greece related (06 May 2010 - Stock Market Panic Dow Crash 1000 Points Before Fed Steps in to Buy). However, the only thing of importance is the actual price action that determines what happens to open positions, the reasons don't count unless they can change the status of positions AFTER the event. The only way to trade is in reacting to price movements in real time based on high probability price triggers, that you have to learn through repetition to trust to execute. As I have mentioned before I will at some point write a book on the real secrets of successful trading. The Bottom line - All forecasts at the end of the day are an analysis of trend that project towards a probable outcome, one cannot forecast a crash on the basis of TREND analysis as a Crash by its nature is NOT a TREND. All one can do is to say if a correction is probable or not during a particular time window and the likely magnitude of the correction and then look for confirming price triggers to confirm that a correction has begun. Even the mainstream press has woken up to highly suspicious trading as illustrated by murmurings on CNBC of market manipulation. I realised that the markets are manipulated on 20th October 1987, when the stock market bounced higher from the open following the previous days 504 point drop. At the time I thought market manipulation was the norm because it was so obvious, however it still remains hidden from the view of the majority of investors despite being a fundamental key determining factor in determining what comes next when attempting to project / forecast. Which is one of the reasons why I ignored the mantra that stocks could not rise in March 2009 due to the impending collapse in corporate earnings and economic depression (15 Mar 2009 - Stealth Bull Market Follows Stocks Bear Market Bottom at Dow 6,470 ). Trading Error ? - "Contributory factor", an erroneous trade triggers computer trading cascade selling (as much as 75% of trading is taken up by high frequency computerised trading). The SEC are investigating. Market Manipulation For Profit ? - "Definitely Yes! ", Sweet 1000 point drop and nearly as sweet 700 point rally within 30mins! Watch Goldman Sachs profits soar for this quarter! Where Will the Stock Market Go Next? The crash has caused volatility to spike extremely high, my instincts tell me to ignore Thursdays extreme low of 9,872, However Friday's low was still a deep 10,241, with the Dow in a wide sideways trading range of between 10,600 and 10,300, pending a breakout. This demands in depth analysis which I will complete within the next few days that will attempt to project a trend out for the next 2 months, trading wise I am going to remain sidelined until then. In the meantime Robert Prechter is kindly sharing his latest stock market analysis report - 10 pages of analysis for all of our readers for FREE "A Deadly Bearish Big Picture". The following table shows the opinion poll projections and forecasts which conclude towards the first opinion poll at the start of the election campaign and the final exit poll being the most accurate in terms of least deviation from the actual election result. Before the election a hung parliament sounded like a good idea, now it does not look so good as there are enough variables being thrown up in the air then to also waste time and effort into trying to interpret an election result that has yet to deliver a UK government. The election results are such that the only functional government that can be formed is as a consequence of a pact between the Conservatives and Lib Dems on a combined total of 364 seats (307+57), well above the 326 seats necessary for an overall majority. Meanwhile the picture for Gordon Brown's Labour party does not look so good where the Labour and Lib Dem total would achieve just 315 seats (258+57), which means that a coalition would need to involve the SNP (6), Plaid Cymru (3) AND some Ulster Unionists which would definitely result in a weak chaotic government that would pander towards these small minority party demands that the markets would not accept. A MAN aged 59 was squatting in a luxury home near the Houses of Parliament last night. 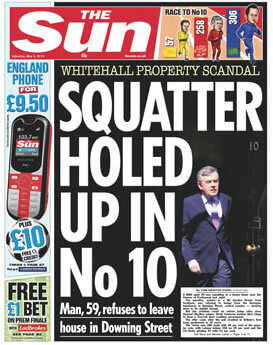 The squatter, named as a Mr Gordon Brown from Scotland, was refusing to budge from the Georgian townhouse in Downing Street, central London - denying entry to its rightful tenant. Sterling Volatility and Euro Crisis? The election result is generating a great deal of volatility for sterling, which pushed it as low as £/$ 1.45. Greece is bankrupt, it should be allowed to go bankrupt, bailing it out just delays the inevitable bankruptcy for a few more years, instead the Euro is suffering because investors know the other PIGS are lining up one by one for their own bailouts without end, with the ECB eventually printing trillions of Euros to monetize PIGS debt (regardless of what Trichett says in public about the Eurozone rules). The Euro in Crisis? What Crisis? They are DEVALUING their currency which is what ALL fiat currencies are engaged in, all of which feeds the Inflation Mega-trend. The Irish are increasingly looking like suckers as they appear hell bent on become a debt servicing state, working hard without growth just to pay the bankster elite their annual pound of flesh. Who knows they may also decide to get some of that fresh Euro cash too ! by threatening to default on their debts. However when the mainstream press is coming out with headlines like "Death of the Euro" and "Euro Collapse", then you know that a market is likely to move strongly in the OPPOSITE direction. Back on 2nd November 2009 my in depth analysis (02 Nov 2009 - Stocks, Dollar and Gold Bull Markets Inter-market Analysis ) concluded in strong bullish trends for Stocks (9,712), Gold ($1046) AND the U.S. Dollar (76.36), I received many emails and comments that my analysis must be wrong as there existed a strong consensus view that Gold Stocks and the Dollar CANNOT Possibly ALL move in the same direction. Well more than 6 months on, that is another market consensus myth well and truly busted, with many now concluding AFTER THE FACT that perhaps Gold and the Dollar COULD both rise together after all. The Gold forecast remains on track to achieve its 2010 target high of $1333. USD hitting 84 has achieved its forecast target, so I will seek to prepare another in depth analysis for the dollar to cover the remainder of the year later this month. Your analyst waiting to see for how long Gordon Brown will continue to squat in No 10. Greece, Europe's Achilles Heel continues to implode under its budget deficit and total debt burden sending a series of strengthening shock waves across Europe's credit and financial markets. Whilst many western economies bounce back from the Great Recession of 2008-2009, Greece's economic depression continues as the economy is set to contract by further 4% during 2010 which is much worse than the 2.5% contraction of 2009 and looks set continue contracting for several more years. Greek Unemployment is soaring to 12% this year up from 9.5% in 2009 and is set to continue higher to 13.5% in 2011. We started out the week with a bang when it was announced that Goldman Sachs was being charged with fraud by the SEC. This sounds ominous at first glance, but in the end it’s a civil matter and will result with no more than a fine and a slap on the wrist. Then toward the middle of the week when the ratings agencies began to write down sovereign debt, first with Greece and then a day later with Spain and Portugal. It seems to me that these agencies no longer serve a purpose as these downgrades are nothing more than an acknowledgement of a situation that we all know existed for quite some time. 5. EXTEND & PRETEND: Uncle Sam, You Sly Devil! The modus operandi (MO) of deviant behavior aids investigators in doing criminal profiling. Forensic accounting takes a similar approach and leads us to some unnerving conclusions about Uncle Sam. As Tax Payers we place our sacred trust in our elected officials and government. Is that trust being handled similarly to how Goldman Sachs apparently has been handling its fiduciary responsibilities? The dot-com bubble of the late 1990s. The housing bubble of the mid-2000s. They both wreaked massive havoc on investor portfolios. Trillions were lost … both here and abroad. At Weiss Research, we take pride in the fact we warned of the epic destruction well in ADVANCE of the twin busts in tech stocks and housing. Two years ago, Jim Grant, ofGrant’s Interest Rate Observer, mentioned a book he had just read by physicist Mark Buchanan titled, “Ubiquity: The Science of History…or Why the World is Simpler Than We Think.” I purchased a copy of the book for my own library and have referenced it in several of my writings. The theme, “the world is simpler than we think”, seems to defy the very modern world we live in. Just look at the picture below. Is this a group of college students learning how scientists have solved a complex physics problem, or a group of citizens trying to understand how the billions in TARP (Troubled Asset Relief Program) funds were created and used? Everyone and their brother intuitively knows that the current government fiscal deficits in the developed world are unsustainable. They have to be brought under control, but that requires some short-term pain. Today we look at a rather remarkable piece of research from the Bank of International Settlements (BIS) on what the fiscal crisis may morph into in the future, how much pain will be needed, and what will happen if various countries stay on their present courses. Some countries could end up paying north of 20% of GDP just on the interest to serve their debt, within just 30 years.